Studio Arts Boulder YSI Class. Photo credit Adam Palazzari. 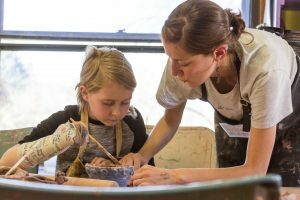 The Arts Education Project Grant provides opportunities for children in the City of Boulder to have unique experiences with practicing artists, access to tools and techniques, or improved instruction in the creative professions. The goal of the grant is to increase the exposure of students to unique and memorable experiences that may shape their future in cultural participation and creative careers. You will receive notification that the panel’s scores and comments on your application are available. Please review their scores and comments and prepare a 3-minute presentation for the Arts Commission meeting on June 19, 2019. At the meeting, the panel will hear all applicant presentations. The panel will then rescore the applications, discuss the scores, and make final decisions on the grants. Details: The award amount of $3,000 is a maximum funding guideline. Smaller requests will be accepted. DEADLINE TO SUBMIT APPLICATION: Monday, May 13, 2019 at 11:59 p.m.
Open to educators, administrators, and presenters. Classroom teachers and school administrators in public schools, private schools, home school associations, and non-traditional classroom settings, as well as artists / individuals / organizations collaborating with schools on programming are eligible. Service area and programming. Projects must have a demonstrated benefit to school children in the City of Boulder. Projects must take place after the grant deadline and end before the end of the 2020 spring semester. Grant proposals are reviewed at Boulder Arts Commission meetings. See schedule. Evaluation of applications. Funding in previous years does not imply continued support. Each application is reviewed anew in the context of current policies and applications. Applicants that have received repeated funding should be aware that the Boulder Arts Commission looks for indication of growth and a fresh approach to their work. The complete scoring system and rubric for the Arts Education Project Grant can be found here. Preview the full report here. To complete the grant report, log on to the Boulder Arts Commission grants software. Log onto the same account used to apply for the grant, and look under “Follow Up Forms” for the reporting form.